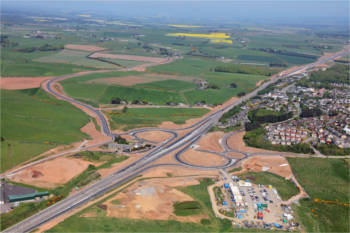 A war of words over the much-delayed Aberdeen bypass has continued after a contractor confirmed that it will not be fully open until at least December. In a trading statement, Galliford Try said the completion date for the final section of the Aberdeen Western Peripheral Route (AWPR), including the bridge over the River Don, is now expected to be in December, ‘owing to increased complexity and weather delays in implementing repairs to the bridge’. The firm said that as a result of higher than anticipated direct costs, and the further delay to completion, its estimate of the final costs to complete the contract has increased by approximately £20m. It added that the final impact on the firm’s financial results ‘will be determined more importantly by the result of the Group's significant claim, in respect of which the Board continues to pursue constructive discussions with the client’. Following the collapse of Carillion in January, Galliford Try is one of two remaining parties (with Balfour Beatty) to Aberdeen Roads Limited (ARL), the consortium building the road. Scotland’s cabinet secretary for transport, infrastructure and connectivity, Michael Matheson, has been increasingly critical of the consortium. Following the confirmation of a further delay, Mr Matheson said: ‘I’m pleased that ARL have accepted my call for an urgent meeting and I look forward to discussing a hopefully swift resolution to the technical issues at the Don Crossing. I have been encouraged by Galliford Try’s trading statement. ‘This confirms the Don Crossing is expected to be completed in December, which is in line with what the chief executive, Peter Truscott, told me last week, before subsequently sending a letter that cast doubt on this. Given this statement is bound by stock market rules, I trust this represents a true reflection of their confidence levels and I look forward to this being reinforced by ARL at the meeting. He added: ‘Even more pressing, however, will be meaningful movement towards opening the remainder of the road as soon as possible. I can certainly see no impediment to this happening if ARL agree to the necessary contract variation on the table.